Our journey began from the starting point that I didn’t want to work in one fixed book as at times I find the limits of the book quite restrictive. I decided to explore different types of books, hand binding/stitching, concertinas, zines…….each of these were inspired by chapters from Elizabeth Gilbert's “Big Magic – Creative Living Beyond fear”. As Camilla and I worked in response to themes of Courage, Enchantment, Permission, Persistence, Trust and Divinity the creative relationship between two complete strangers led us on a fascinating journey. Through twists and turns our monthly additions took us on creative and physical adventures. Personally, book ten was a highlight with Camilla sending me a box of incredible little bottles, each containing minute messages. I learned to take risks, set challenges, gave myself and Camilla permission to explore and at times had to trust that the European postal service would deliver our precious packages. Our labours have resulted in a beautiful box of curiosity which reflects my metamorphosis both as a teacher and an artist. This whole process continues to inspire me and my students, has provided a precious network which this year gave me the confidence to move onwards and upwards professionally. When I was asked to write a couple of paragraphs reflecting on my collaboration with Yvette Hughes, my first thought was “Oh my!” as brevity isn’t what I am best known for! The second thought was “so difficult!” To put into words all that the partnership has given me. So much more than words and pictures. I have had a blast! I have been challenged and I have been scared witless! I had met Yvette at a Sketchbook Circle event held at The Baltic last year. Elaine Humpleby was there too and they were partners. They had both brought their respective books with them to swap at the event, and I was in awe of the excitement and quality of their work and wished that my sketchbooks were that inviting. When I received the mailout in December with Yvette’s name and address I was SO excited…..and SO scared. I waited with anticipation for the end of January. I was not disappointed, but I was a little overwhelmed. Yvette had written that she was struggling and had decided to try an approach out of her comfort zone. 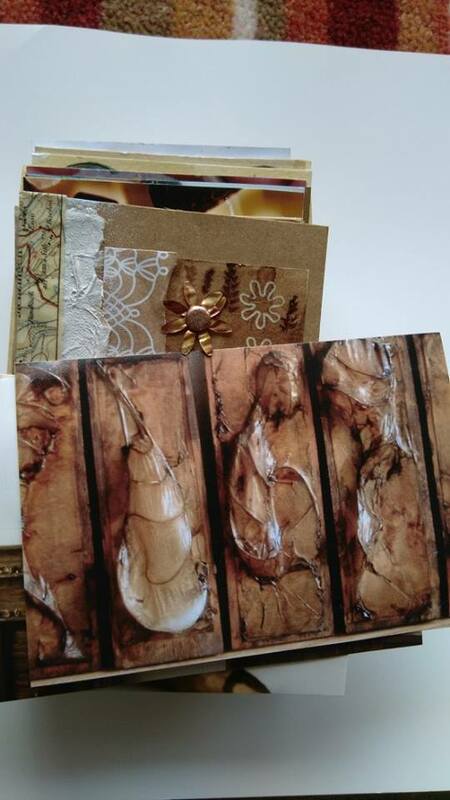 This was to create over the year, a series of twelve books - she had made two, filled one and sent them both to me. Hers was beautiful, mine was...empty! I had a full book to fill and a month to do it. Yvette had left a clue, she had been reading a book, parts of which had resonated and had based her book around the first chapter. She had left one word in mine. The word turned out to be the title of the second chapter. The book - Big Magic: Creative Living Beyond Fear. I bought the book and began to read. I took a leap of faith and began tentatively making marks. I copied some of the marks she had made and tried to incorporate colours and text, also as she had done. Mirroring, as a child would. I managed to finish and returned both books. What would she think? Was it OK? I am not a brave artist and had done very little of my own work over the years of teaching. I eagerly awaited the next exchange, but realised I would be away for much of the month and would not receive it. Contacting Yvette, we decided that as we were on a journey about conquering fear, taking risks and following your dreams we would take this as a challenge. The books were posted to a rented cottage, down south, at the other end of the country. I was visiting there for one day, so our postal service was tested to the hilt! Were we successful? Yes we were! This exchange took the collaboration up a notch. We were on a journey and so were the books themselves. The book this time was a different style - accordion. I was growing in confidence, still mirroring and matching, but including imagery of my own too. The following exchange, still staying with Big Magic, is one you all know about - zines! Great fun! And this time they journeyed to the North of Scotland, near Inverness. My fear had disappeared by this stage, and I was enjoying being challenged. My confidence had increased and had shown our books to others at a NEATEN meeting. More positive comments. The next journey was a long one and too dangerous for all the books to travel to, so just mine was sent - to the south of France to a campsite in the Pyrenees! This time the format was an enormous cotton reel, with about 50 yards of paper - oh goodness, help! Teasing photos of its sister reel back home, accompanied it. I hope I met the challenge - I certainly enjoyed creating my response. We had finished the book and so needed a new direction. Yvette’s mailing was to be my biggest challenge. It arrived. A conceptual book, in a box. An amazing collection of postcards, written to a variety of people that had connections with her. Inspired by collections, it contained some ‘treasure’, with a request to return some to their home. It was fabulous and truly inspirational. My box was...empty! What! How do I follow that. A brick wall loomed, so, I got in touch to ask questions - does she want me to return all the treasure? Keep some? is she expecting postcards? The answer “anything! I wanted you to enjoy some ‘me’ time and enjoy the day.” “ No, it doesn’t need to be postcards, do anything” and so true to the answer and strangely close to the book, I was given permission. I chose some stones - found on the beach where the ‘treasure’ was returned to and took them on a plane, to the Alpes! Documenting journeys is something I have done for a few years. 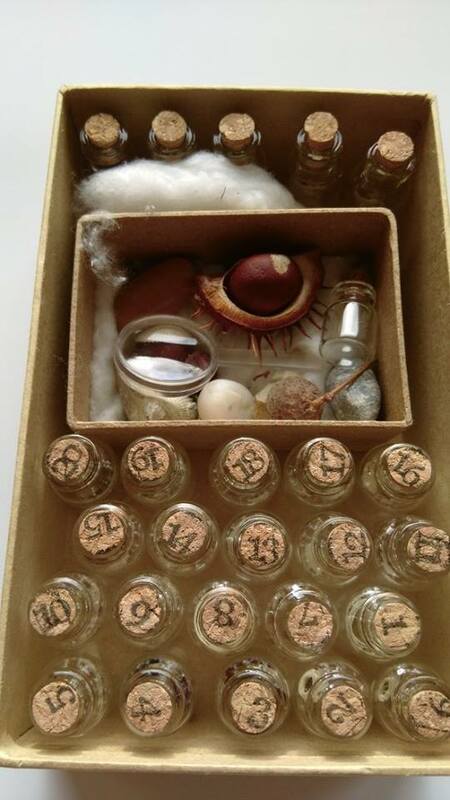 My box, I filled it with bottles, specimens, and photos of course! Loved it and I hope Yvette did too. In conclusion - well I am waiting for that parcel! The collaboration - what it has meant to me? Permission to create. Permission to succeed and fail. Freedom. Thank you Yvette and Sketchbook Circle. I did say brevity wasn’t my thing!